​Through the Park the Plow program, Capital RC&D promotes no-till farming as a more profitable and environmentally-friendly alternative to traditional farming methods. The no-till method involves planting new crops into previous crop residue to reduce soil erosion. What are the benefits of a no-till approach? This method of farming has been known to improve soil, water and air quality through controlling sediment and nutrient run-off. It significantly reduces fossil fuel consumption and lessens a producer’s energy and labor costs over time. No-till farming is also favored as a time-saving strategy of participating producers. Despite these benefits, local farmers have avoided making the transition to no-till farming due to comparatively high start up-costs of the program. The Park the Plow initiative aims to dissolve this potential risk for farmers by subsidizing much of the expense of a no-till transition. Producers interested in taking up a no-till farming approach in Adams, Cumberland, Dauphin, Franklin, Lancaster, Lebanon and York counties may apply for project aid through Park the Plow. Producers in each of the counties listed receive technical assistance and planning services as well as incentive payments, where applicable. The need for technical knowledge to make the transition to no-till successful will be included in the form of a landowner payment for the services of a Certified Crop Adviser, to develop a “transition plan” for the acreage enrolled in the program. This plan will address relevant issues such as fertilization, soil quality, pest control, manure, cover crops and equipment. The program aims to promote a continuous no-till approach to farming for at least 3-5 years because research has found that a continuous no-till method is both more efficient and more environmentally beneficial than a sporadic no-till commitment. As a supplement to Park the Plow, Capital RC&D has also initiated a “Farmer to Farmer” program in Lebanon county and is promoting that farmer-to-farmer exchange in all areas that we are working in. This program encourages experienced no-till farmers to consult with new users to help them overcome the initial challenges that might arise from a transition to the new farming method. 12 new farmers and 8 farming mentors participated in this networking program last year. The implementation of this mentoring initiative further diminishes the professional risks associated with no-till farming. As a final goal, the Park the Plow program strives to transform 9,000 acres of local farmland (approximately 40 farms) to sites of no-till and cover cropping. 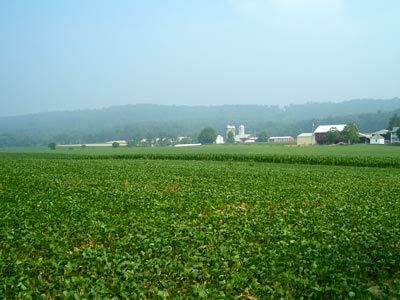 Capital RC&D has partnered with the Department of Environmental Protection (DEP), Natural Resources Conservation Service (NRCS), Penn State Cooperative Extension and participating county conservation districts to create and fund this program.